Pirates of the Shackles prowl rivers in skiffs, rowboats, and coracles in search of easy prey. Those who prove handy at waterway robbery might someday find a position on the galleons that frequently raid along the coast and waylay trade ships. They are adept at navigating the treacherous marshes of the area, and able to survive the unending raging hurricane. Some gifted pirates possess the ability to sail unharmed into the Eye of Abendego, harness its power for their own purposes, and make legends of their names. Skills: Appraise 5 ranks, Profession (boater or sailor) 5 ranks, Swim 5 ranks. 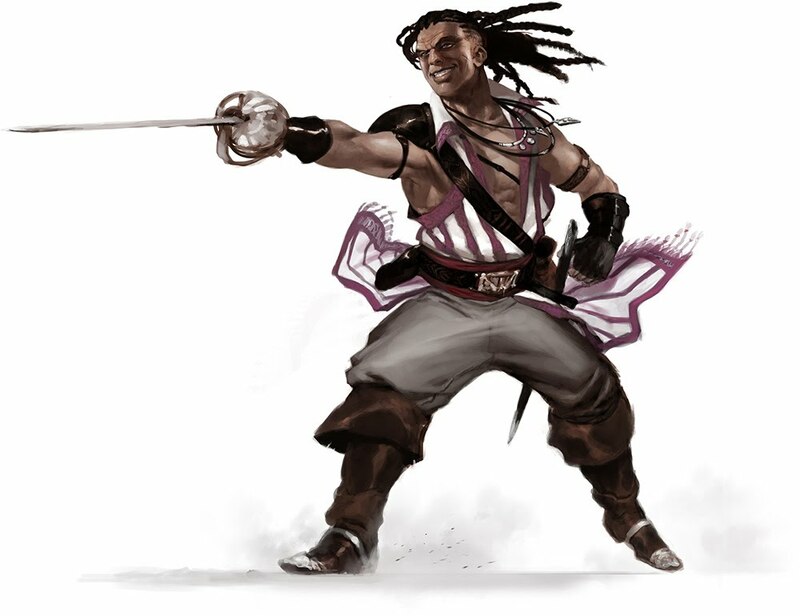 The shackles pirate's class skills (and the key ability for each) are Acrobatics (Dex), Appraise (Int), Climb (Str), Craft (Int), Diplomacy (Cha), Intimidate (Cha), Knowledge (local) (Int), Perception (Wis), Profession (Wis), Stealth (Dex), Survival, Swim (Str). The following are class features of the Shackles pirate prestige class. A Shackles pirate must at times quickly select the most valuable items to spirit away. She may appraise the value of an item in 1 round. Shackles pirates spend their careers studying and adapting to their unique, marshy environs. As a result, they develop skills which allow them to stealthily approach their targets even over the wettest, muddiest ground. Most wear dark green and brown clothes made of oilcloth (to repel water) and reed hats with angled brims to keep rain out of their eyes. Shackles pirates sometimes string small beads in their hair to generate a quiet susurrus as they walk. This mimics the sound of wind in the bogs and helps mask the noise of their footsteps. A Shackles pirate gains a +2 competence bonus on Stealth checks made in marshes, bogs, or swamps. At 5th level this bonus increases to +4, and at 10th level the bonus increases to +6. At 2nd level, a Shackles pirate can hold her breath for a number of rounds equal to three times her Constitution score before she must start making Constitution checks. This is identical to the rogue sneak attack ability, and stacks with sneak attack gained from other sources. The Eye of Abendego, the hurricane that constantly rages offshore, poses a hazard to all ships moving along the Shackles coast. Shackles pirates know how to successfully navigate the gusting winds and churning water. The hurricane exerts some unfathomable mystical influence over some of the pirates of the area. As a Shackles pirate’s connection to the Eye of Abendego grows stronger, she learns to perform impossible feats. At 7th level, a Shackles pirate gains the ability to stop another ship dead in the water for a short time. To use this ability, the Shackles pirate must hurl a grappling hook at the target ship. The pirate is proficient with the grappling hook, and she throws it with a 20-foot range increment. If the Shackles pirate hits the target ship, she then makes an opposed Strength check. She gains a +1 bonus on her check for every crewmate who also grapples the enemy ship, although crewmates are considered non-proficient with grappling hooks and throw them with 10-foot range increments. For every point by which the Shackles pirate exceeds the ship’s Strength check, she halts its progress for 1 round. At 8th level, a Shackles pirate can, once per day as a standard action, control her ship with a thought. The Shackles pirate must be on the deck of the ship she wishes to control and she must be conscious. Once the Shackles pirate activates her shipmind, she can feel the ship as if it were an extension of her body. She can “see” from the ship anywhere she wants, and adjusting her point of view is a free action. The Shackles pirate can move the ship as if it were her own body, and it moves over water at her base move or the ship’s normal speed, whichever is greater. She and her ship can move forward and backward, make right angle turns, and come to a dead stop, despite the ship’s size or the weather conditions. While the Shackles pirate uses her shipmind ability, her body appears paralyzed and unresponsive. She is considered helpless and cannot defend herself, but she retains an awareness of what goes on around her body (and can see her body from her perspective on the ship if she wishes). She may end the shipmind effect as an immediate action. This ability lasts for 1 round per class level. At 10th level, the Shackles pirate gains the incredible power to shape a vessel out of the fog that roils across the boggy landscape. This ability functions only in the Shackles and is usable once per day. Forming a craft takes 10 minutes, and the craft’s duration lasts for a variable number of hours depending on its size. A fogcraft appears made of swirling gray mist but feels solid to the touch. Its unique composition can make it difficult to spot, and the craft makes no sound, but it does not baffle sounds made by its crew. A fogcraft has a carrying capacity equal to an ordinary ship of its type, but its impermanence makes it a poor cargo ship. It requires the appropriate number of crewmen in order to sail. A fogcraft possesses speed and maneuverability equal to that of an ordinary ship of its type, but unlike ordinary ships, a fogcraft can move over land as easily as water. A Shackles pirate receives a +4 competence bonus on skill checks made to sail her fogcraft. When a Shackles pirate creates a fogcraft, she can chose its size from any of the options listed below. With larger ships comes a trade-off in stealth, Armor Class, and duration. 1 Including the Shackles pirate herself. Pathfinder Chronicles: Campaign Setting. Copyright 2008, Paizo Publishing, LLC; Authors: Mike McArtor, Keith Baker, Wolfgang Baur, Clinton J. Boomer, Jason Bulmahn, Joshua J. Frost, Ed Greenwood, Stephen S. Greer, Jeff Grubb, James Jacobs, Michael Kortes, Tito Leati, Mike McArtor, Rob McCreary, Erik Mona, Jason Eric Nelson, Jeff Quick, Sean K Reynolds, F. Wesley Schneider, Leandra Christine Schneider, David Schwartz, Amber E. Scott, Stan!, Owen K.C. Stephens, Todd Stewart, James L. Sutter, Greg A. Vaughan, Jeremy Walker, JD Wiker.